Without minimizing the culpability of those who created and have perpetuated the Flint water crisis, much less the pain of the citizens, I want you to consider that the crisis in Flint, Michigan, is not quite as catastrophic as it seems. In particular, the various parts of the cure for the problem seem doable at a reasonable cost. Throwing a billion dollars at the problem, as some have suggested, is a meretricious grab at the tax revenues of the state and the United States. Although I’m not a trained scientist, I’ve studied the problem of water availability and purity for several years. This work culminated in my applying for a patent on a method of converting sea water and polluted water at the source on a mass scale into drinking water at a very low cost. My patented water treatment method will not work in Flint, since the lead problem is in the city’s underground pipes and not at the source of the water. Using my years of experience in water purification, though, I’m going to look at the facts of the problem, propose a possible scandal, and then describe some inexpensive ways to solve the Flint water crisis. In the above picture, ALL of the color in the water is due to iron and rust corroding from inside the pipes running through and under Flint. This iron is technically not dangerous, although it must not be tolerated in any drinking water system. The presence of lead cannot be seen in water with the eye. Note that “corrosive” as used to describe drinking water does not mean unsafe. The use of the term “corrosive water” is a term of art; the water itself is safe to drink. Mostly corrosive water just has a higher Cl content and pH level. And the “anti-corrosion additive” is also safe to drink. Mostly the additive just alters the chloride and acid balances in the water. Tests show that the water as it leaves Flint’s treatment plant to be distributed to the households of Flint is lead free, according to http://www.mlive.com/news/flint/index.ssf/2015/10/see_step_by_step_how_lead_is_g.html This is important: to make clear that the water plant is not the problem. Also, the routine testing of water within the plant or at the output of the plant would not, now or in the past, have been likely to reveal the presence of lead contamination. The problem of elevated lead levels lies between the water plant and the individual tap. The water that Flint had drawn for years via Detroit from Lake Huron was non-corrosive and had been treated with orthophosphate, a common anti-corrosion additive. (see mlive, supra.) When the city switched to Flint River water two things happened simultaneously. 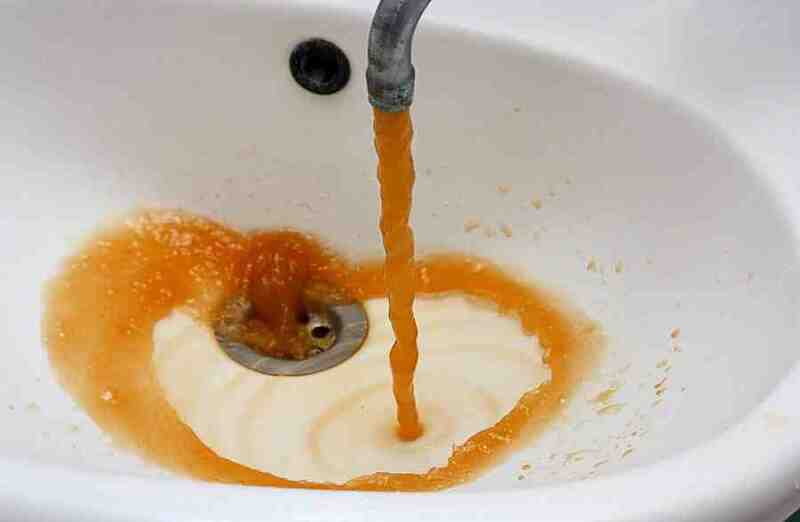 First, the new source of drinking water was at least eight times as corrosive as the Detroit water. Second, the Detroit orthophosphate anti-corrosion additive was switched off cold turkey. This corrosive water is pumped into pipes that carry it to about 31,000 homes and businesses in the city. (see mlive, supra.) At least 15 percent of the city’s homes have water with lead levels exceeding the safe limit established by the federal government. (see wired, supra.) Simple math, then, yields that about 4,600 homes and businesses have a serious lead problem. At $1,000 per fix, the cost of repairing these individual problems comes to about $4,600,000. A far cry from the billion dollars some have bandied about as a cost for the fix. This is only one of the costs, though. Almost all the homes and businesses are receiving orange water from iron and rust corrosion inside the pipes. Though intolerable, this colored water is not life-threatening. Is there a fix for the color problem in the water? Well, yes, there are inexpensive ways to solve this problem and also to stop any further lead leaching. By inexpensive I mean a few millions, very far from a billion, when the tab is added up. I’ll discuss these methods after a slight digression. Is Anyone Covering Up a Scandal? First, those who make decisions about the Flint water supply glibly say they had to cut off Detroit water because it was “too expensive.” Now one of the things about city water in general is that the costs of producing drinking water are passed on to the consumer by way of a monthly water bill. So were the water bills getting too high, or were some of the expenses of production getting paid out of other city funds? For years Flint had been using Detroit water. Was Detroit charging Flint more than it was charging Detroit residents for their drinking water? I haven’t heard any complaints of high water bills in Detroit. 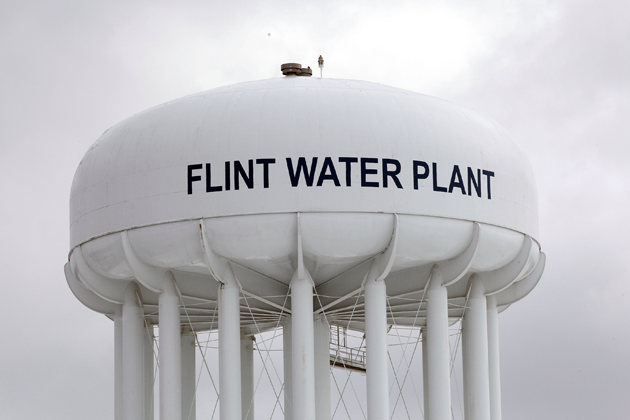 So was Detroit marking up the price substantially when it sold water to Flint? Is this even legal? Water cannot be sold on the free market using supply and demand because there is no free market in water. Was Detroit jacking up its prices on water to Flint to try and solve some of its own fiscal problems or to pay off people? The Detroit connection could uncover a long-running scandal (or not) and needs to be investigated. Second, were those who made the changes in the Flint water source somehow expecting to profit by making this change early, before the Huron to Flint water pipeline was complete? The total and complete lack of scientific standards in making the change leads one to speculate that whoever did it may not have cared who they hurt. Follow the money, look for a scandal. Third, some have speculated that somehow the goal of increasing fracking in the area is behind all this bad water in Flint. First, fracking is a legal and economically beneficial activity. Second, the Huron to Flint water pipeline is already under construction and will be completed. That Flint jumped the gun has nothing to do with the needs of frackers. No scandal there. Was the water coming from Detroit treated or untreated? I assume it already contained the additive orthophosphate, so maybe it was entirely or mostly treated, which would mean that the costs of running the Flint water treatment plant should be quite low. Ask the State of Michigan to pay for the increased water prices while the matter is investigated and the water problem resolved. They’ve already pledged $29 million, which should be quite enough to do everything which is needed. The next step is to find a way to release most of the iron and lead which is now flaking through the underground system of pipes to appear at the tap. There are several possible inexpensive ways to do so. The first will be to intentionally generate “water hammers” throughout the underground distribution system. I don’t know if this is the correct term for what would be done, but it is descriptive of the process. Usually this would mean bringing in equipment to increase the water pressure throughout the distribution system, then slamming valves to turn the water off and on. This should create a distinct sonic vibration throughout the system, which will knock loose a lot of the corroded residue inside the pipes, which could then flow out the individual taps. The ideal situation would be to ask someone to be present in each household (or business). When the water hammers are done, a loud industrial whistle would sound and everyone would open all the taps in their houses and let the high pressure water blow out the corroded material. In any event, it would be necessary to have maybe a hundred plumbing vehicles on standby to go and fix any leaks that develop in homes during the process (tax paid). Crews from Flint and others brought in from the outside can work on leaks that develop on the city side of home meters. After the hammer and the first flush, water pressure should be reduced but still stay above normal for a while. People should keep their taps open for an hour or two if possible after the flush to make sure the worst of the corrosion is washed out. It would be even better if the water hammer could be applied to different parts of the city at different times, so as to lessen the temporary chaos. This would depend on whether the main distribution pipes have discrete branches. The military has devices which can generate very strong extremely low frequency pulses. I assume that some companies have such gadgets also. Bring in one or more of these machines and attach them to the feeder pipes someplace between where they leave the water plant and enter the distribution network of pipes. You will also here need the ability to increase the water pressure throughout the network as described before. Then, as before, recruit home and business owners to stand by their taps. Raise the water pressure and then generate a long series of sonic pulses which will rattle the pipes all the way to the tap for ten minutes or so. Then sound the whistle and everyone will open their taps and let out the corrosion that was shaken loose by the pulses. Repeat if necessary. Then follow the earlier described routine afterward. Once the loose corrosion is jostled free and blown out of the system, there should be only a few hundred or more follow-up problems with individual households and businesses. The combination of using Detroit water and the force-cleaning of the pipes should generate clear and lead-free water in a matter of weeks. Then at some later time the Huron to Flint water pipeline will be completed and Flint can switch away from Detroit water permanently. I’m sure there are many other quite inexpensive solutions or partial solutions to the Flint water crisis. If you have an idea, tell the right people. Get involved. THE PROBLEM MUST BE RESOLVED! I’m saying we need to be intensely aware that just throwing money at the problem is not the answer. From http://www.mcgeepost.com Copyright © 2016 by Michael H. McGee. All commercial rights reserved. Non-commercial or news and commentary site re-use or re-posting is encouraged. Please feel free to share all or part, hopefully with attribution.